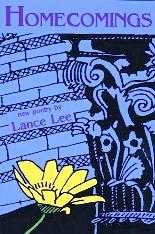 A poet, playwright, novelist, and writer on drama and screenwriting, Lance Lee is the author of thirteen books. A past Creative Writing Fellow of the National Endowment for the Arts, his fourth collection of poetry, Seasons of Defiance, was a finalist in the 2010 National Best Books Awards. Homecomings, his sixth collection, reinforces his considerable achievement as a poet. In Seasons of Defiance, he wrote: There is nothing left for me to do but go/ deeper, ever deeper, into my meaning. (‘Dreaming The End of Going West’). That is what he does in Homecomings, his passion and compassion in engaging with a panoramic range of experiences deepening. He writes with conviction: I see all there is, and all a man may see. Homecomings reflects not only the greater complexity of our world, but also the poet’s increasing awareness of human limitations, sometimes making him rage with an intensity one cannot miss: My anger soars in the squealing air, / for I desire all you desire more intensely / you who can never age can know. (‘Mrs Robinson’) or Stop asking me about love: all I know / is betrayal, injustice, rejection, dreaming. He adds Don’t think fame consoles / a love never gained, a love that then / cannot be lost. The truth is we die and love with us. (‘Dante To An Admirer Obsessed With Love And Fame’). He talks of art – the enamelled bird that no longer sings on his ivory bough, but whose beauty, once heard, must destroy us all. He also writes wittily about old men wearing young women like bangles (‘Contra Ravenna’). there are only cruel or worn out men. wake us from lifelong nightmare. The unexpected image of the crucifixion transforms us along with the poem. The ability to transform suffering into joy provides a reason for living, to make what we can of our lives. The metaphor of dreaming-waking, darkness-light, illusion-reality appears in several poems. There is an additional dimension to the dialectic as we all enraptured know for one moment / that what is real is rare, that our lives are / entangled, endlessly new and strange (‘A Hula Girl Weaves Death And Memory and Life Into Her Dance’) raising the question of the dancer and dance. Like Yeats, Lee argues for one, united view of life and death. Know Thyself. / ‘That command/ still lives in my blood, Lee reminds us in ‘My Father’s Shade At Delphi At The World’s Center Amid The Ruins Above The Olive-Swaddled Valleys’. There is no defence against our common fate (death) except love, the joyous knowledge / of all I am / and that I am / and that I am where I should be. on earth, in earth, of earth. The transmutation of life and love is indeed what all art, including poetry, is.